We've worked with thousands of catering businesses just like yours. We’ve funded investments over the years that have saved caterers from closing their doors and funded investments that have helped successful caterers exceed their goals. A caterer cash advance from Quikstone Capital can help your business respond to market shifts, grow and profit. A caterer cash advance can also help you prepare for emergencies or recover should disaster strike. Use our calculators to assess your potential return on a cash advance or apply today. 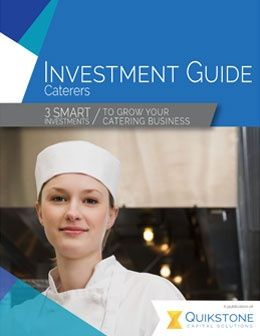 Want to know more about growing your catering business? Visit our resources page or Merchant Cash Advance Blog. If you still have questions, our full service sales team is here to help.